I have been enjoying cherries by the bowl full lately and while I was snacking on a bowl I was thinking about ice cream. I remembered seeing Mike’s cherry frozen yogurt with chocolate stracciatella at Mike’s Table and thinking that I just had to try it. I realized that I had not really done an ice cream with chocolate chips and now was the perfect time since cherries and chocolate go so well together. This recipe did not however call for chocolate chips but rather melted chocolate was poured into the ice cream when it was almost done and still in the maker which sounded like fun. I went with my standard ice cream base and I used halved cherries as I wanted some nice big chunks of cherries in the ice cream. The stracciatella ice cream was a bit more challenging to make than normal ice cream as you have to time the melting of the chocolate and pouring it into the ice cream when it is almost done but not quite. The cherry and chocolate stracciatella ice cream turned out really well. I though that I might have poured the chocolate in a bit too late but the chocolate had mostly formed nice little flakes. There were also a few big chunks which were always nice to run into. The cherry and chocolate flavoured creamy ice cream was really good! Heat the cherries and sugar in a small sauce pan until the sugar is dissolved and the cherries are tender, about 10 minutes. Heat the cream and milk in a sauce pan until it almost boils, about 5 minutes. Add one tablespoon of the cream mixture to the eggs to temper them. Add the egg mixture to the sauce pan. Cook at low heat until it thickens and can coat the back of a spoon. Remove from the heat and stir in the cherries and vanilla extract. Start freezing according to the instructions for your ice cream machine. When the ice cream is almost done melt the chocolate and pour it into the ice cream in a thin stream. looks decadent. I hope you ate this in lieu of dinner. Oh my goodness, what a scrumptious ice cream!!!! so lusty…damn thats some sweet and creamy looking flavor. Wow that looks wonderful! Thanks for stoppin by my blog. You have some amazing recipes here. I think I have to add you to my blog list! Oh my, chocolate and cheery! Nice combo, yet again! I love cherry and chocolate, so this would be perfect in my home. Your last picture is gorgeous of the cherries. Kevin, I want to eat all the ice cream in that bowl! So decadent and I love the colour. We’ve been eating cherries like crazy too. This sounds like a whole new level, though. Looks gorgeous too. I must admit, however, we had a bad experience with a really bad ice cream maker and were pretty much put off making ice cream. What kind of ice cream maker do you use, and what are your secrets for success? I love cherries … and yes, I agree that cherries + chocs sounds like the perfect companions! Talk about a bowl of perfection – yum! This looks seriously awesome. Makes me want an ice cream maker! This ice cream looks delicious. I love it when there is actual pieces of fruit or chocolate in my ice cream. What a great dessert! This looks so good! I really love the chocolate/cherry combination too. Cool, I just got an ice cream maker today, I’ll have to give this recipe a whirl, it looks terrific! oh man, I LOVE when the chocolate is in flakes like that. This makes me want to run out and get an ice cream maker! My mouth is watering – it always does when I visit your site. The ice cream looks amazing and so does that bowl of cherries. This would fix my sweets cravings. Great picture. You’re da man, Kevin. This looks positively sumptuous! Cherries r in season for you? How lucku! Gorgeous! Wonderful combination! Cherries are always delicious. Kevin you have such a huge fan base and well deserved. My favorite ice cream at coldstone is chocolate and I add double cherries, roasted almonds and brownie. Too bad it is 2am or I would go get some. This looks wonderful. I am not a big fan of non-dairy, non-eggs “ice creams”. 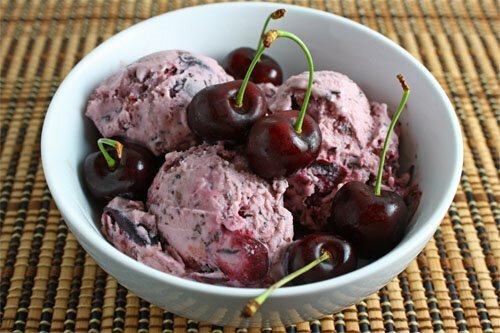 So your ice cream sounds like a heaven to me, especially because I love cherries! Awesome ice cream! Love the chocolate and cherries together. Thanks for the kind words! It looks like you did a great job with this one. Its definitely one of my favorite flavors–enough that I had to whip up another batch as soon as I ran out of the first one. I’d scream for that ice cream:) looks delish! Oh what delights of such a scrumptious ice-cream Kevin!! OMG, you’re killing me here!! Chocolate and cherries are a match made in heaven and I *love* the idea of using that combo as an ice cream flavour. Beautiful. Wonder if yuo could macerate the cherries in brandy first?? wonderful, your recipes is good. Pls add me. Looks great! I love a good stracciatella (“little shreds”). Yours looks awesome! I finally put my ice cream maker in the freezer so I could make some ice cream. Too bad I don’t have any cherries to make this one! What a fabulous looking summery treat! Oh, does that look good and so do the zuchinni cakes. I wish I would have seen your granola recipe earlier. I just made some this week too and yours looks so very good…. Oh that looks so good. I wish our cherries weren’t so much here. Cherrrries and Choc mmmmm I am in heaven! Terry B: I am using a Cuisinart ICE-20 ice cream maker. It was priced ok and I have been happy with it so far. Jeanne: Macerating the cherries in brandy sounds good. Kevin, I would be your best friend if you gave me a bowl of this, all I can say is WOW! I love cherries so much and I just know that this would taste exellent! What I wouldn’t do for a bowl of that right now! Great looking ice cream Kevin! I really need to consider getting an ice cream maker. I made ice cream this evening to – yours looks wonderful. You never fail to impress me! and you have done it yet again! I’ve had my eye on the recipe as well. Looks so good and indulgent. Yum, that ice cream looks wonderful! Love the picture of the bowl of cherries too, makes me wish I had some at home right now! Beautuful colour and nice presentation. I’m not even kidding – I need this immediately. I really wish I had a bowl of this right now. Looks delicious! That looks delicious! Wow. The color of the ice cream is lovely. I cannot believe I missed this one Kevin. Your ice cream sound so amazing, ice cream heaven! I am glad you described the pouring in process as I haven’t tried that before. You still have cherries Kevin! And what a great way to use them! beautiful colour..must have tasted awesome. Mmm…chocolate and cherries. I love surprise chunks of chocolate in my ice cream. WOW!! i love cherries! yum! (1) Used 2 cups half-and-half in place of the heavy cream + milk. I like this better as a base due to the greasy mouthfeel heavy cream sometimes imparts. (3) Cooked the cherries with all of the sugar, instead of saving some sugar for the dairy. The instructions were unclear — mentioning sugar in step 1 and 2 — so I made a judgment call. (4) Added the seeds from one vanilla pod to the dairy as it was heating instead of using extract. I almost didn't add the chocolate but I'm glad I did — I think the flavors really go well together. I think I might add a bit less chocolate next time and even more cherries. Thank you for sharing such a wonderful recipe! YUM.